Home/Daily Post/Historical/September 1, 1604 The First Prakash Purab of Shri Guru Granth Sahib Ji. September 1, 1604 the 411 Anniversary of the First Prakash Purab of Shri Guru Granth Sahib Ji. 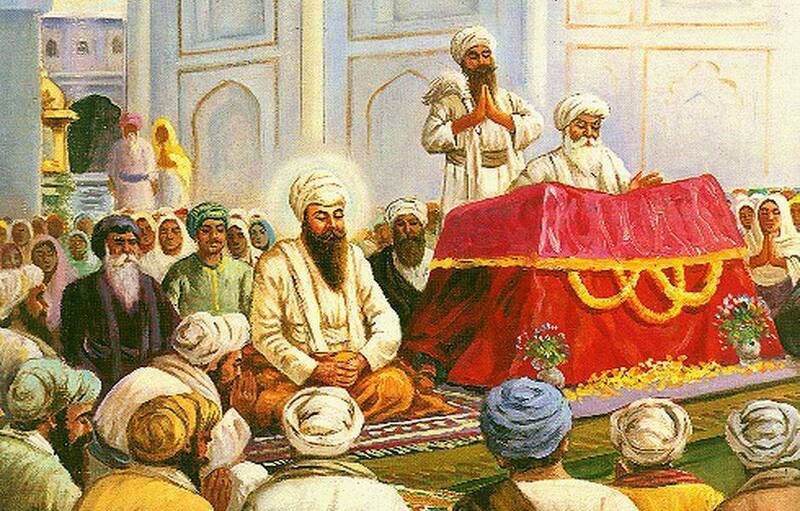 Guru Arjan Dev Ji installed Adi Granth at Harmandir Sahib Ji 1604. Baba Buddha Ji was the First Granthi and Bhai Gurdas Ji completed Adi Granth Sahib Ji as dictated by Shri Guru Arjan Dev Ji in 1604. Later Guru Gobind Singh Ji adds Shabads of Guru Teg Bahadur Sahib Ji and then in 1708, Adi Granth became Guru Granth Sahib Ji, the Eternal Guru of Sikhs as was declared by Guru Gobind Singh Ji. The Guru Granth Sahib was first compiled by the Fifth Sikh Guru, Arjan Dev, in 1604 in the city of Amritsar. Its second and last version was the handiwork of Guru Gobind Singh, and it was finalized at Damdama Sahib in the year 1705. He added the hymns of his father, Guru Tegh Bahadur, the Ninth Master, and a couplet of his own to the volume wrought a century earlier. Since then, the authorized version has been transcribed and printed a number of times, and it abides. Its adoration or veneration is an article of faith with the Sikhs. Religious literature is sometimes sectarian and monolithic, if not partisan and polemical. It may admit of few variations and shades. No word but its own may be allowed sanctity and sovereignty. One of the greatest glories of the Guru Granth Sahib is its catholic character. Hardly any other scripture of that stature is completely free from bias, animus and controversy. Indeed, the uniqueness of the Granth in this respect is all the more astonishing when we think of the obscurantism, factionalism and fanaticism of the period in which it was composed. Perhaps it is the only scripture of its kind which contains within its sacred covers the songs, hymns and utterances of a wide variety of saints, sages and bards. For, it is instructive to note that a fairly substantial part of the volume carries the compositions of Hindu bhaktas, Muslim divines, Sufi poets and other God-intoxicated souls. Of course, their hymns and couplets rendered in their own idiom find a ready correspondence in the songs of the Sikh Gurus. Obviously, the idea of Guru Arjan Dev was to affirm the fundamental unity of all religions, and the unitary character of all mystic experience. It was, so to speak, an integral congress of minds and spirits operating on the same spiritual beam. To have thus elevated the songs of the bhaktas and the bhats to the condition of the logos was to salute the power of the word whatever form it might take to reveal the glory of God. For, it may be observed that Guru Granth Sahib comprehends the compositions and utterances of the high-born Brahmins and the proud Kashatriyas as also of the so called lowly Shudras and the unlettered Jats. This was done at a time when the caste system in India had paralysed the conscience of man. The revolutionary egalitarianism which such a step symbolized was, therefore, to become the creed of the Sikhs. Above all, a poetic and mystic collage bespeaks the essential humility of the Sikh mind, for humility has been given pride of place in the table of virtues drawn up by the Gurus. The Guru Granth Sahib, then, is a sui generis scripture in the world.It is indeed, a magnificent compendium of the religious, mystic and metaphysical poetry written or uttered between the 12th Century and the 17th in different parts of India. It is, also, at the same time, a mirror of the sociological, economic and political conditions of those days. The satire on the reactionary and tyrannical rulers, on the obscurantist clergy and sects, on the fake fakirs and their like, is open, uncompromising and telling. In showing the path to spiritual salvation, the Guru Granth does not ignore the secular and creative side of man. Another outstanding feature of the Guru Granth Sahib is the precision of its prosody. While a great deal of it, cast in traditional verse forms (salokas and pauris), could best be understood in the context of the well-known classical ragas, its hymns and songs make use of popular folk meters such as alahanis, ghoris, chands etc. The integral relationship between music and verse has been maintained with scholarly rectitude and concern. This complete musicalisation of thought in a scientific and studied manner makes for the unusually rigorous, yet supple, discipline of the Granthâ€™s metrics and notations. The entire Bani whose printed version in its current format comes to 1430 pages(Ang) is divided into 33 sections. While the first section comprises the soulful and inspiring song of the Japji composed by Guru Nanak as also a few selected pauris or couplets, the final section is collection of assorted verses including the shalokas and the swayyas of the bhattas. The remaining 31 sections are named after the well-known classical ragas such as sri, magh, gauri, gujri, devghandhari, dhanassari, bilawal, kedara, malhar, kalyan etc. The division, thus, is strictly based on Indian musicology. Furthermore, each psalm or song is preceded by a number (mohalla) which denotes the name of the composer-Guru from Guru Nanak onwards. It may be noted that the apostolic succession extends from the First to the Tenth Guru, and that the Gurus are often referred to reverentially by their place in the order. What is more, each Guru speaks in the name of the Founder Guru whose spirit permeates his successors. The House of Nanak is indeed a spiritual decagon based upon a complete, inviolate geometry of vision. The major hymns-Japji (Guru Nanak), Anand (Guru Amar Das), Sukhmani (Guru Arjan Dev), Rehras (Guru Nanak, Guru Ram Das, Guru Arjan Dev) are widely recited solo and in congregation by the faithful as morning and evening prayers. Their soothing and ambrosial airs have brought solace and cheer to countless people all over the world.